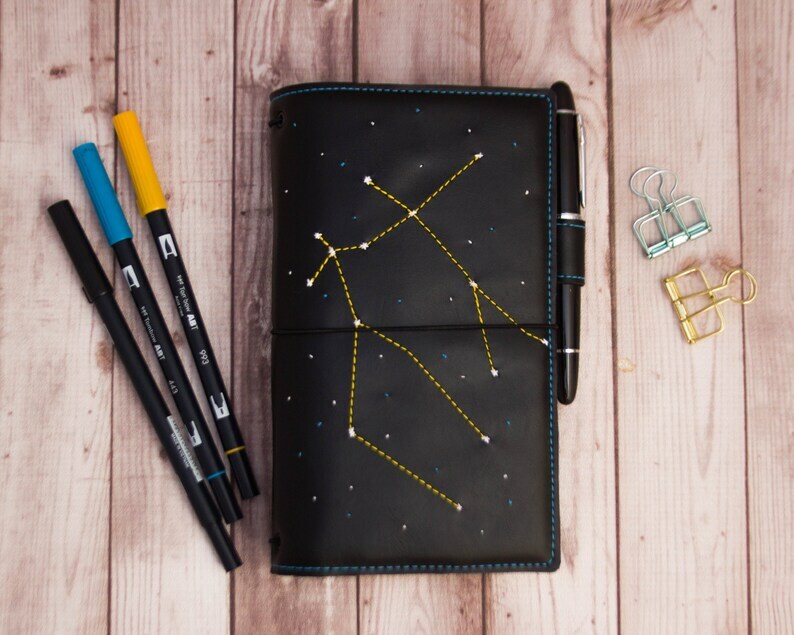 This zodiac sign traveler's notebook is a handmade vegan journal made of faux leather. The shape of the constellation is carefully stitched in yellow and the stars are hand-sewn in white and blue. 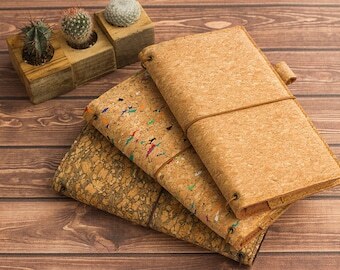 It has pockets on the inside, including card holders. 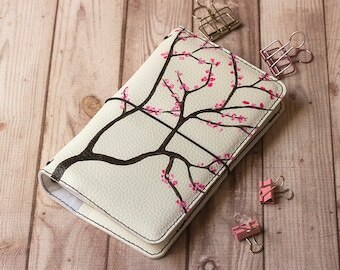 Passport, pocket, A6 and personal size have two card holders on the left side, and the rest of sizes have three card holders, as the pictures. 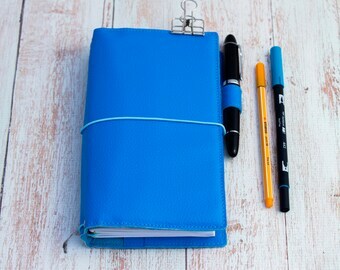 It also comes with a pen holder, so you can take your favorite pen everywhere. This pen loop is designed for pens with a diameter of 15mm (0.6 inch), but if you need to fit other pen, just let me know! All the sizes fit about 3-4 inserts. If you want it to fit more inserts send me a message and I'll make you a custom cover. • A6: 4.1" x 5.8"
• PERSONAL: 3.75" x 6.75"
• B6 SLIM: 4.25" x 6.9"
• B6: 4.9" x 6.9"
• REGULAR: 4.3" x 8.25"
• WIDE: 5" x 8.25"
• EXTRA WIDE, A5: 5.8" x 8.25"
I absolutely love this cover. 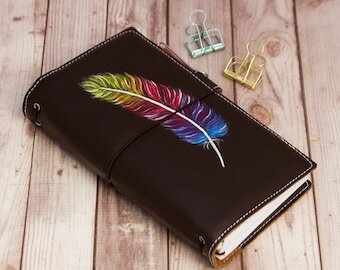 The stitching is done very beautifully, the colors are vibrant and it’s a very sturdy cover overall. I also love that it feels kind of squisky because of the soft faux leather, but that’s probably just me, haha! Rocio has done a great job again. Even better than expected! 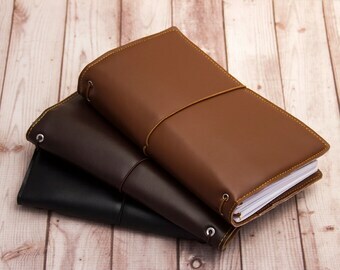 The material is soft, the stitching is beautiful, and it’s wide enough to easily hold 4+ true B6 size notebooks. Would absolutely recommend and purchase from them again. I love these covers! This is my second one. The first one is still just as beautiful as when I ordered it but I'm fickle and wanted a new cover for the new year. The quality is amazing and shipping prompt. And this came with a note thanking me for ordering again, so that was a very nice touch. Highly recommended! Gorgeous and well made! Love it.